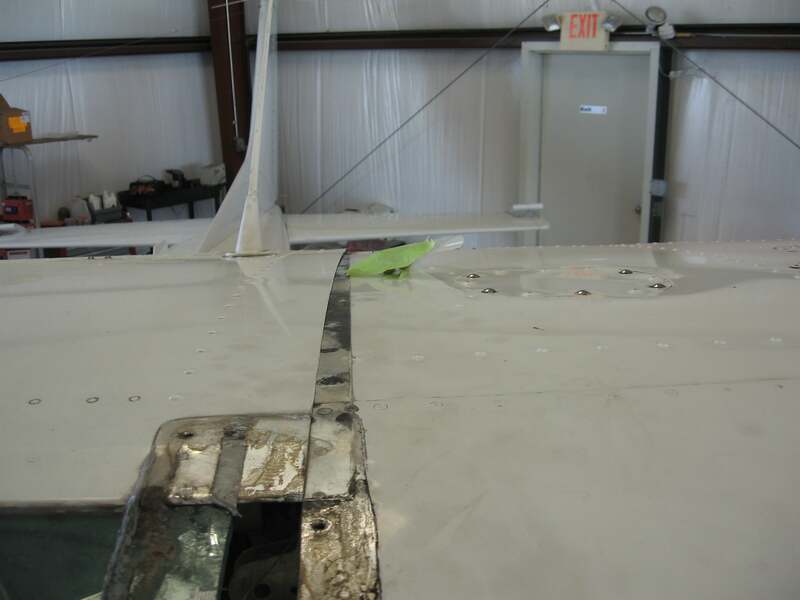 182 Wing Demate | Tennessee Aircraft Services, Inc.
Cessna that requires major surgery to see are the two wing spar carry­thru channels located in the top of the cabin. These two U shaped channels span from left to right connecting the fore and aft wing attach points. The forward channel is at the top of the windshield, and the aft unit is at the top of the rear door post. Being a U shape, they also just happen to make a great storage place for moisture. The wing attach bolt spacer blocks are mounted at the ends of the forward channel as well. All of these are very susceptible to corrosion. Neither channel has any easy access for viewing inside to determine their condition. Some resourceful owners have decided to create small holes in the channel or the cabin top skin to give access with a borescope. This is great, except these are primary structural components and some sort of approved data must be acquired for such alterations. One owner/friend decided, given the publication of the new Supplemental Inspection Documents (SID), that this annual was a good time to get a proper look at these channels. Taking stuff apart is usually the fun stage. One must be careful to pay close attention to details while having all this fun, otherwise a great deal of fun may be lost for the reassembly. This is the time to take lots of pictures and put seemingly useless labels on everything. As you’re disconnecting control cables, wiring connections, fuel lines and all manner of other “stuff”, you’re telling yourself you’ll remember exactly where everything goes. Don’t kid yourself, you probably have a difficult time remembering what you ate for breakfast yesterday (at least I do). 4­4. REMOVAL. 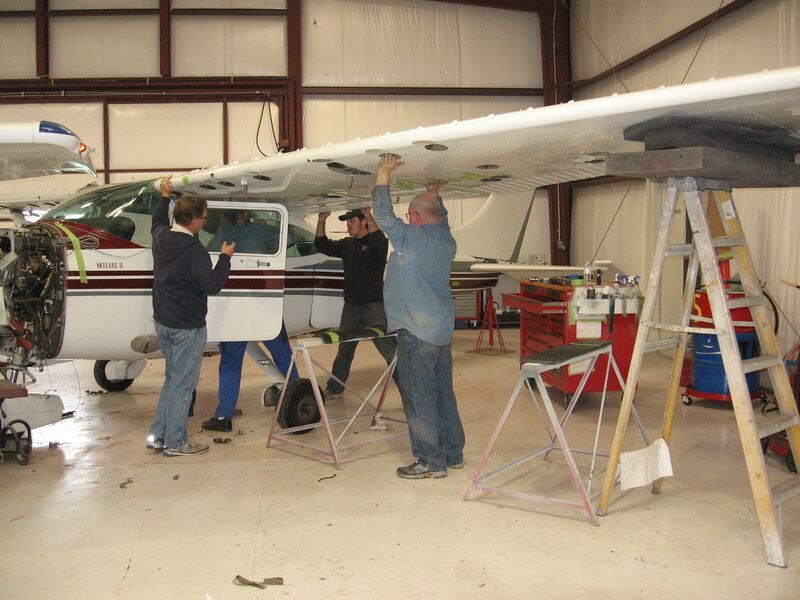 Wing panel removal is most easily accomplished if four men are available to handle the wing. Otherwise, the wing should be supported with a sling or maintenance stand when the fastenings are loosened. Remove wing root fairings and fairing plates. Remove all wing inspection plates. Drain fuel from cell of wing being removed. Electrical wires at wing root disconnects. Pitot line (left wing only) at wing root. 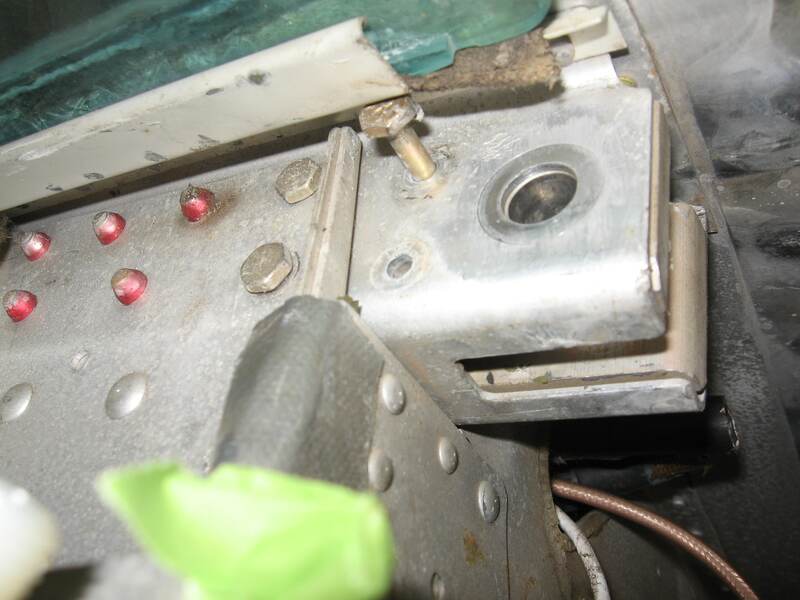 Reduce aileron cable tension by loosening the turnbuckles, then disconnect cables at aileron bellcranks. Disconnect flap cables at turnbuckles above headliner, and pull cables into wing root area. To ease rerouting the cables, a guide wire may be attached to each cable before it is pulled free of the wing. Cable then may be disconnected from wire. Leave guide wire routed through the wing; it may be attached again to the cable during reinstallation and used to pull the cable into place. Support wing at outboard end and disconnect strut at wing fitting. (Refer to paragraph 4­10.) Tie the strut up with wire to prevent it from swinging down and straining strut­to­fuselage fitting. Loosen lower strut fairing and slide fairing up the strut; the strut may then be lowered without damage. Tape flap in the streamlined position during removal to prevent damage because the flap is unsecured. Mark position of wing attachment eccentric bushings (See figure 4­1); these bushings are used to rig out “wing heaviness”. Remove nuts, washers, bushings and bolts attaching wing spars to fuselage. It may be necessary to rock the wings slightly while pulling attaching bolts, or to use a long drift punch to drive out attaching bolts. Remove wing and lay on padded stand. You can read it in less than a minute, but it takes a couple of knowledgeable techs the better part of a morning to have the wings on sawhorses. The “four men” called for in the first sentence is an indication that the manual was written before many women were working in the technical side at Cessna. Actually, the only time four bodies of either gender are needed simultaneously is when the wing is ready to be lifted off the cabin. It’s not very heavy, but it is rather ungainly. The Cessna requisite four men to remove lift off the wing. We chose a slightly different process when dealing with the lift strut and removing the wing attach bolts. A proper height ladder with a cushion on top can be used to help support the outboard end of the wing. We slide the lift strut fairings along the strut to give good access to the attach bolts. The top bolt is removed and the wing pivots up just high enough to allow the strut to pass through the opening in the bottom of the wing. The outboard end of the wing is lowered down to the cushion on the ladder. Everyone can relax while the lower strut bolt is removed and the strut is taken out of the way. The ladder with cushion should be tall enough that the wing has at least the same dihedral, if not just a bit more, than with the strut attached. This gives enough room between the wing root and the cabin to deal with the two wing attach bolts. 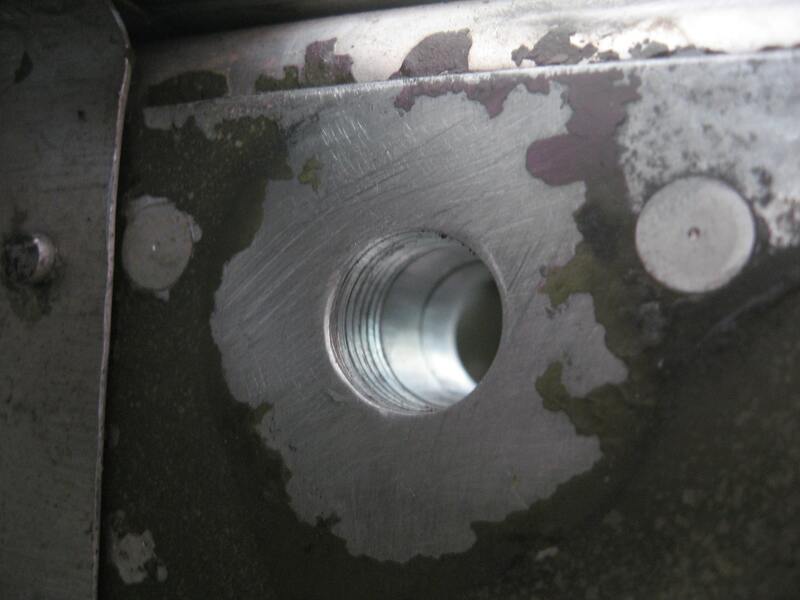 We remove one bolt at a time and replace it with a pin or other round shaft tool that is a bit undersized in diameter. After both wing bolts are replaced with pins, everything can be double checked for final wing demate. This way three of the “four men” aren’t stuck holding the wing and strut in place while the fourth guy/gal struggles to figure out why the last bolt won’t come out. Getting the undersized pins installed at the wing roots. Note the lift strut is already attached to the cabin and ready to swing up to the wing. It’s a great idea to set the wings upside down so all the inspection panels are easily accessible. The view inside the wing is great and the time to apply corrosion inhibitors is now. If a spray applicator for one of the well known corrosion inhibitors isn’t available, just wipe everything inside the wing with a Corrosion X saturated cloth. While the wing is upside down, all that chemical will have plenty of chance to work its way into all the crevices in the top of the wing. When the wing is reinstalled, all the extra magic chemical will migrate to the bottom surfaces and do its thing there, too. While the wings are soaking, we can move on to the real reason for this invasive surgery. The lift strut attachment areas should be closely inspected. There are several layers of structure here, so extra time should be taken while it’s easy to see. Pay particular attention to the bolt hole itself. Less knowledgeable technicians will often “screw” these bolts in or out instead of moving the parts around to find that sweet spot where the bolt will slide in. This twisting action cuts threads into the wing structure. This can be dressed out if not allowed to get too deep. This area of the wing spar is also the subject of a couple of the SIDs. 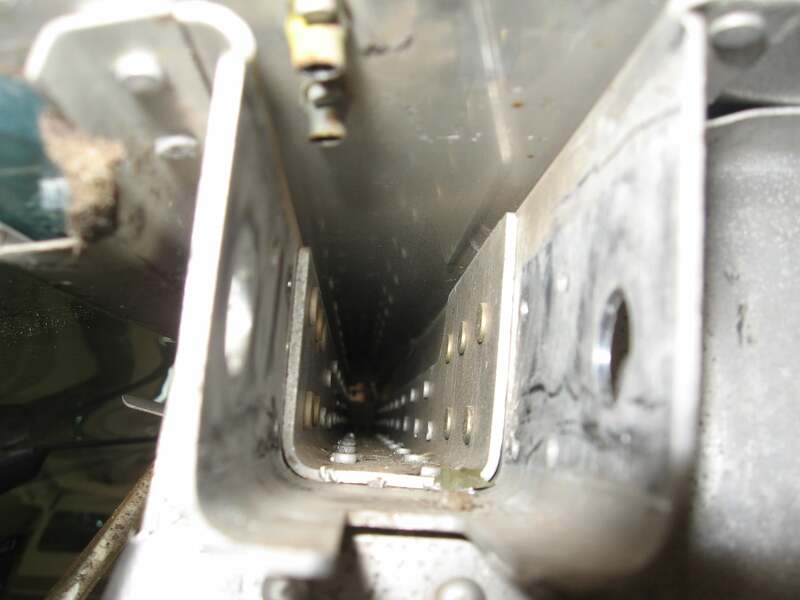 The bolt hole in the wing spar at the lift strut attachment showing where someone had used the bolt threads to draw the bolt into place. The rear wing carry­thru is as open as it’s going to get at this point. A strong light and viewing from both sides gives an excellent view for signs of corrosion. The spacers for the wing attach bolts are riveted in place, so any inspection will need to be done in situation. The SID for this area calls for Eddy Current inspection to find cracks. If that’s too pricey or inconvenient, and proper compliance with the SID isn’t required, then a good dye penetrant check will be the next best thing. Reminder: While SID compliance isn’t mandatory for U.S. registered aircraft operating under FAA regulations Part 91, they may be required for certain commercial operations or aircraft registered in other countries. Be sure you fully understand the requirements for your specific aircraft. If you are officially complying with the SID during this demate, actual Eddy Current testing may be required. View of the inside of the forward wing spar carry-thru after the spacer block is removed. The forward wing carry­thru has a wing bolt spacer block mounted at each end. Best inspection access requires removing these blocks. There are four small bolts that hold each block in place, so one would expect to just take those out and the block compliantly slides out. It should work that way, but it soon becomes obvious that the blocks were bolted into the carry­thru before the carry­thru was riveted to the cabin. One bolt head will have to be cut off to remove it and reinstalled in the opposite direction later. No worries though, the replacement bolt won’t know it’s in backwards. With the forward carry­thru blocks removed, the full U channel can be inspected even easier than the aft carry­thru. The one backwards bolt that has to be cut to remove the spacer block. be happy it’s found now and not later, like during the family trip to see Mickey Mouse. If it’s the typical minor surface corrosion, a nice wadded up chunk of Scotchbrite can be plunged from end to end for pretty decent cleaning. Since this area isn’t likely to be revisited for another ten plus years, using a temporary corrosion inhibitor isn’t the best choice. An epoxy primer would be great, but I’ve not seen a paint gun that will fit in the carry­thru channel and do a nice job at the same time. Fortunately, the damage was light enough that just a little work with Scotchbrite satisfied Cessna engineering (and me). For this job we want something that goes on liquid for easy spreading and that will stay in place for a long time. We keep AV­8 in the shop for this application, but other products like CorBan or Aerospec Protect Spray from Rocol will do the job as well. They can be sprayed into the channel in fairly large quantity, then spread around with a toothbrush on a stick. Until it cures, any excess will drip out through the various screw holes, so be sure to protect any upholstery. This is a great time to thoroughly inspect or replace the spacer blocks. The ones from this plane appear to be in excellent condition, so we performed a dye penetrant inspection of each just to confirm. Each was coated with AV­8 just prior to being reinstalled with new hardware. 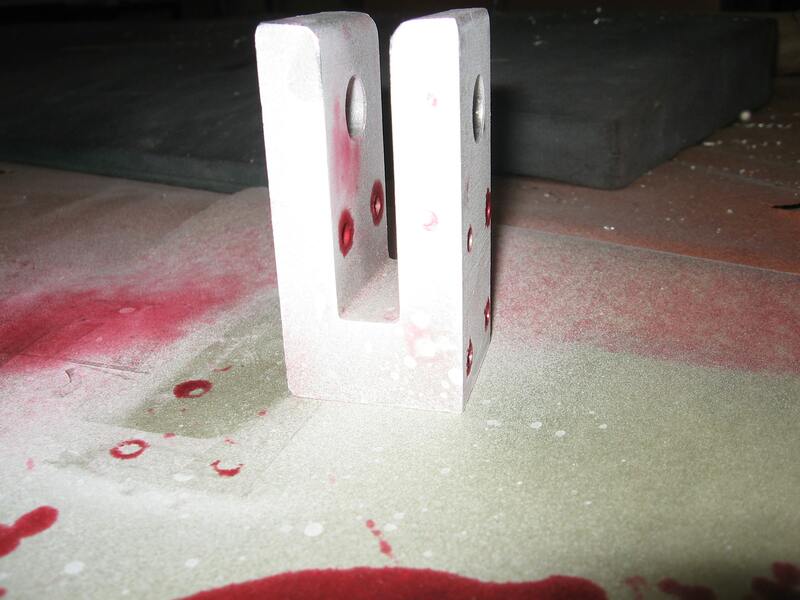 One of the spacer blocks covered in dye penetrant developer to look for any cracks or voids. Cessna’s instructions are pretty close to reality. There will be some details you’ll have to deal with depending on what avionics or other alterations are installed on your plane, extras such as slaved compasses, speed brakes, extra fuel tanks, RADAR pods, STOL kits, and JATO bottles. Great care must be used when offering up the wing to the cabin to prevent the top wing skin from clashing with the cabin top skin. This is the other point in the process that needs the “four men” Cessna calls for. We get the wing spar bolt attach points secured with undersized pins first, just as was done during disassembly. The lift strut lower bolt can be slid into place, then the outboard (top) attached. Finally, the wing spar bolts can be installed. If everything is properly aligned, the worst fitting bolt should only require a light tap of a hammer to seat it in place (no turning action allowed, please). Be sure to lubricate all these bolts with MIL­G­21164 grease prior to assembly in accordance the maintenance manual. Re-installation making sure the wing skin slides cleanly under the cabin top skin. Hold wing in position and install bolts, bushings, washers and nuts attaching wing spars to fuselage fittings. Be sure eccentric bushings are positioned as marked. Install bolts, spacers and nuts to secure upper and lower ends of wing strut to wing and fuselage fit​tings. Electric wires at wing root disconnects. Fuel Iines at wing root. (Observe precau​tions outlined in Section 12). Pitot line (if left wing is being installed.) 4. Cabin ventilator hose at wing root. e.Rig aileron system (Section 6). Rig flap system (Section 7). Refill wing fuel cell and check for leaks. (Observe precautions outlined in Section 12). Check operation of wing tip lights and landing and taxi lights. Check operation of fuel quantity indicator. Seal all openings common to fuselage root rib and adjacent to fuel cell with cloth backed waterproof tape. Tapes recommended for usage are; Polyken 224, 230 or 231. Permacel P­69, P­670 or P­672, or Tuck 92T. Be sure to insert soundproofing panel in wing gap, if such a panel was installed originally, before replacing wing root fairings. Install all wing inspection plates, interior panels and upholstery. I find it interesting that item e. Rig ailerons is listed prior to item f. Rig flaps. This actually can’t happen because the ailerons use the proper full up position of the flaps as their neutral reference. Definitely, swap those two so the rigging will work out correctly. Finally, add all your plane’s specific extras to the list somewhere before item k. Install wing root fairings. One of my sisters had an operation last year, and all seemed great for a while. Then there was some annoying discomfort following by increasing degrees of pain. Eventually she revisited the doctor for some tests. It was discovered a sponge had not been properly accounted for during the closing of the surgery. The doctor was apologetic and they performed another procedure to remove the offending foreign object. Even with all the safeguards in place, humans are still human. Wing demate is about as serious surgery as you’re going to have in the life of a 182 airframe. It affects the fuel system, lighting, flight controls, rigging and structure. To that point, this work should have at least one extra set of eyes to inspect every single action taken. It’s not about how good you think your mechanic is, he or she is still human and capable of making human error. Everyone’s life is at stake, so don’t let anyone’s pride get someone hurt. The last step in this process is to the fly the plane. If all has been done well and thoroughly double checked, this first flight should be a total bore. Keeping in mind the extent of the work performed, this is the flight to actually read and follow all those pre­flight checklists you’ve been doing from heart for so long. This is not the time to get in a hurry. Of utmost importance, make double sure all the flight controls move in the proper direction before even starting the engine.